People often ask how I became interested in e-government issues and in digital literacy initiatives. 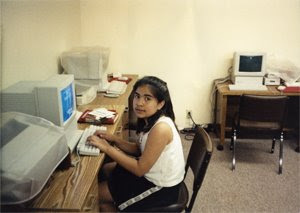 As I explain in the beginning of the Virtualpolitik book, the answer has to do with my first job after graduating from college: running after-school educational programs for a delinquency prevention center, where I expanded the computer lab considerably. As I describe in the book, in 1989 this center was one of the experimental sites for the Public Electronic Network or PEN, which was run by the city of Santa Monica in an attempt to create opportunities for public discussion and deliberation in a series of related online venues. It has since been written about by Howard Rheingold, Mark Poster, and a number of other academics. As someone who used the system and supervised the accounts of "at-risk" youth, I was struck by the fact that teens and pre-teens almost instantaneously treated it as a social networking site for peer-to-peer exchanges in what I have described as a "high-tech version of passing notes," despite all my lofty ambitions for engaging them with a direct digital democracy. Today I had lunch with two of my wonderfully smart and funny former students at the center, who found me through Google, and who have since gone on to colleges, careers, and families of their own. One of them actually brought a picture of herself at the old lab, which she has agreed to have reproduced in the MIT Press text, and we reminisced about this early initiative in computer-mediated communication. She remembered the experience vividly and pointed out that it was actually I who had unintentionally introduced the practice of using the machines for informal in-room electronic messages, when I had wanted to demonstrate the speed at which a piece of virtual mail could travel from one terminal to another. It was a great afternoon of catching-up and an important reminder of the long-lasting benefits of digital literacy programs in which kids are given opportunities for both structured interactions and improvised electronic contact. I'll bet this trip down memory lane was grand. It must have been great to see also the convergence, inter-influences, and divergences of the virtual and the physical realms in the context of the passage of time.